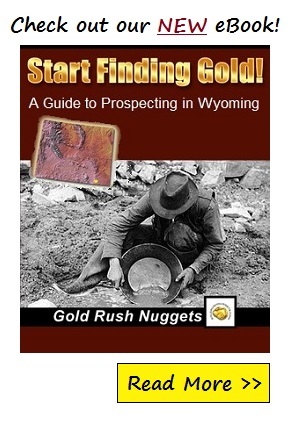 Gold prospecting in Wyoming gets surprisingly little attention in comparison to some of its neighboring states, despite having vast mineral wealth. There are less people per square mile in Wyoming than any other state, so it is no surprise that it has been explored less than many other areas. Most think of Wyoming in terms of cattle ranching, oil, and natural gas, but plenty of gold has been discovered here too, although not nearly as much as many other western states. Long and harsh winters can make for a very short mining season here. The first reports of gold in Wyoming were as early as 1842, by westward travelers along the old emigrant trail at the Sweetwater River. Indian hostilities made prospecting efforts difficult for several decades. By the 1860’s, prospecting efforts increased and several rich discoveries were soon found throughout the state. The South Pass- Atlantic City District lies at the southern end of the Wind River Range. Additional districts in the area include the Lewiston, Twin Creek, and Oregon Buttes districts. Significant lode and placer gold has come from these areas. Production records were extremely poor from these areas during the early gold rushes here, but hundreds of thousands of ounces are known to have come from these districts, and quite possibly several times that amount. In the central part of the state in the Granite Mountain Range, the Tin Cup, Rattlesnake Hills, and Seminoe Districts have been mined. Most exploration efforts have shown low grade gold ores, but limited investigations show potential for areas worthy of investigation by the recreational prospector. The Absaroka Mountains in the northwestern part of the state produce gold in several areas. The Sunlight, New World, Kirwin and Stinking Water districts all have placer gold deposits that can be recovered by panning, sluicing and dredging. Limited commercial efforts have been put into this area, but recreational prospectors can find plenty of gold here. The Laramie Mountain Range has several districts worth investigation. The Silver Crown, Garrett, Warbonnet, and Esterbrook all produce gold. The Medicine Bow and Sierra Madre Mountains in south-central Wyoming were prospected extensively during the late 1800’s up through the great depression. Numerous mines are scattered throughout the region and still have good potential to yield gold. Keep in mind that often these mines were abandoned because of low metal prices, not because they were worked out. With today’s record high gold prices, there is a good chance that these old prospects are once again profitable for gold mining. Wyoming is one of the most remote states in the US, so take the appropriate precautions when searching for gold. Wyoming has excellent potential for prospecting. Many large discoveries have been found in fairly recent history, and there is no doubt that more are remaining to be discovered. Wyoming is also fortunate to have a large amount of public lands, which is generally open for mineral exploration.